Welcome to this new and horrifying game that we here at Videoslots.com offer; Halloween Horrors! This is a great game for those of you who enjoy a good scare. Halloween Horrors offer you both the excitement from playing a great video slot with a great chance of winning and the scary horror-movie excitement! Here you will encounter evil pumpkins, ghosts, headstones, bats and so much more. A whole bunch of different symbols with one thing in common: they are all really spooky! This game has five wheels, three rows, 25 paylines and a lot of great features such as wild symbols, scatter symbols, free spins and a headstone feature. The Wild symbol is the evil pumpkin. The wild symbol will pay the highest possible prize and it will act as a substitute for all the other symbols except for the scatter symbol and the headstone. The skull is the scatter symbol. This symbol will award you with up to 15 free spins at once! It can be placed anywhere on the wheels. Get three of these symbols and you will be awarded with 5 free spins. If you get four skulls you will be awarded with 10 free spins and if you get as much as 5 scatter symbols anywhere on the wheels you will be awarded with as much as 15 free spins! During the free spin feature all the free spin wins are doubled! Another great feature is the Headstones. The headstone symbol is only active during free spins and it does not need to be matched left to right, get three or more headstone anywhere on a winline to win a prize! The wild symbol cannot be used to match headstones. Two headstones pays 7x, 3x pays 30, 4x pays 100 and 5x pays 200! With the Autobet Selector you will be able to play with as much as 250 spins without having to click the Spin button for every spin. Click on the blue Autobet button, located to the left of the spin button and use the buttons to enter the amount of reel spins you wish to activate. You can also use the step buttons to enter the exact amount. When you are satisfied with your spin settings, just push the Autobet button and your spins will start! You can cancel the Autobet feature anytime by pressing the blue cancel button. The music in Halloween Horrors is very spooky which suits the Halloween theme perfectly. What would Halloween be without evil laughter and scary organs playing? To play without music or adjust the volume you just need to click on the music icon in the left bottom corner. 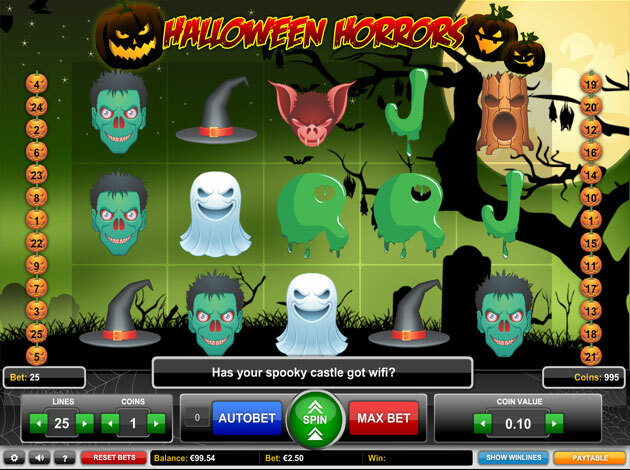 Halloween Horrors has a minimum bet on £0.05 and a max bet on £750 which means that this spooky game is suitable for most wallets. So do not miss this great Halloween themed game! We can assure you that this video slot will soon be one of your favourite games. You will enjoy the sound, the gameplay and the great design and theme. Come Trick-or-treating with us here at Videoslots.com, take the chance and win some serious money!